Who should I ask questions, and how do I ask? Your first stop should be your mentor -- that's what they're there for! If they aren't available or you haven't been assigned a mentor yet, you should contact a GMod or administrator instead. 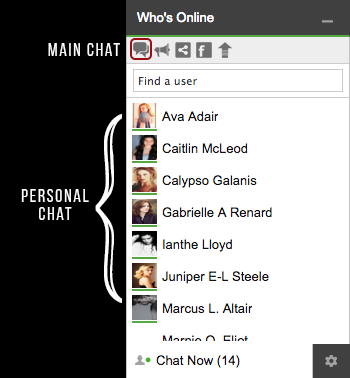 You can Private Chat (PC) your mentor/a staff member if they're online for an immediate response. If they are not online, you can Private Message (PM) instead. Alternatively, you can always go into Main Chat (MC) and ask your question there. Just remember that other players might also be new and may not be able to help you! RP = Role-play. This encompasses everything that we do in character (IC) here. OOC = Out of Character. All interactions in the General OOC forum and its subforums (Introductions, Absences, etc. ), and all chat interactions are out of character, as they are between the players, not the characters. IC = In Character. All of the forums listed as physical places (gardens, rivers, lakes, cabins, etc.) are in-character forums where you are writing as your character. It's important to remember the difference between OOC and IC -- just because someone doesn't like you IC doesn't mean that they don't like you OOC! PM = Private Message. Access your PMs by clicking the 'My Messages' tab at the top of your screen. PC = Private/Personal Chat. You can find this by clicking 'Chat Now' in the bottom left corner, and selecting the player you wish to chat with. MC = Main Chat. Players often chat together here, so come and say hello! NPC = Non-Played Character. An NPC is a character that isn't written by a certain player, but that your character may know, i.e. a roommate, or a sister. They exist, but they are not written. Thread = an IC topic in a forum where your character interacts with other characters. 'Posts' refer to the replies in a thread. Subbie = the text below your avatar. These will eventually hold your magical levels. Avatar/avvie = the photo of your character below their name. What's the chatroom/main chat for? The chatroom/main chat (MC) is the best place for OOC interaction. You can plot with other players in real time, ask questions, and connect with other site members. What do the names in brackets at the end of thread titles mean? What do 'open' and 'closed' mean? There are multiple ways to mark threads for certain people. The most commonly used form is to put the requested character name after the title e.g. "Disorderly / Lucille" or "Forgive Me (Mina)". Only Lucille may reply to the first thread, only Mina to the second, as the threads are meant specifically for those people. It would be impolite to join the thread without an invitation. Similarly, if a thread is marked with 'closed' or 'invited' after the title, do not post in it unless you have been asked to do so by the person who started the thread. You may join threads that are marked as 'open' e.g. "Inside The Lines // Open". These threads are open to any players who wish to join, and that includes you! If I want to send a spell at someone, can I say that it hit him and he fell down? You can't. That would be powerplaying. Powerplaying is when you determine/control the actions of another character. It's frowned upon in the role-playing world, so don't do it! You wouldn't want someone to determine what happened to your character, so let your role-playing partners decide what happens to their characters. If you aren't sure whether something would be powerplaying, the best thing to do would be to ask your partner. I made a mistake in my post! How do I change it? Go to the post, and look at the column beneath your character's name. There will be a button with a green + sign called 'Edit'. Click on it, you'll be able to edit your post. Be sure to hit save after you're finished! The only exceptions to this are in duelling and applications, where editing is not allowed. Next to the 'Edit' button, there may be a 'Delete' button. Some forums allow it and some do not. If there is no button visible, that forum does not allow you to delete your post. In this case, contact a staff member, and they can help you! What's double-posting and why can't I do it? Double-posting is when you reply to a thread and then immediately type another reply -- it's considered impolite. After you post, you need to wait for someone else to reply to your post before posting again. How long should my posts be? What if I don't have enough to say? Your posts can be as long as you'd like them to be, but we ask that you try to post at least 3 paragraphs of at least 3 sentences each (unless you have agreed with your RP partner to do shorter posts beforehand). Think about the surroundings, your character's feelings, etc. If you're still stumped on what to add, read some other threads to get an idea of what other players include in their posts. We also encourage you to write some of the workshops - the more that you know about your character, the more you'll be able to say! The term 'canon' means the material that is 'official' in a fictional universe. Here we have two different kinds of canon. We have the official canon as established in the Harry Potter series and we also have the established canon of this RPG. Because we are an alternate universe (AU), we only use parts of the Harry Potter canon. We also have our own canon that has been established by the players here over the years. This canon is made up of all the events and people that have been created here. This is why we ask that you not say, for example, that your character’s mother was Head Girl when she was at Hogwarts. Because our RPG has such a long history, that role was already filled by another character in our canon! Instead of trying to come up with your own canon, try to find ways to fit your character into the canon that we’ve already established here. We love to plot, so don’t be shy about asking in chat or PMing other players to find ways to fit your character in. Additionally, it is currently the 1950s in our universe. Please try to keep this in mind. While you don't have to intensely research every part of your posts, try to keep it as period appropriate as possible. Major differences to keep in mind are clothing styles and technology. Student characters would not be permitted to have unnatural hair colors, tattoos, piercings (aside from single ear piercings for females), or unusually revealing clothing. Cellphones and other small electronics were not in common usage yet; furthermore, most electronics do not work at Hogwarts, because the concentration of magic in the castle interferes with them (per the books). We understand that many of our players here are interested in other fandoms, and that's great! However, this was created as a Harry Potter roleplaying game, so make sure that you stay within our canon and don't introduce other fandoms' canon into your writing. The one place you may experiment with writing other universes is the Freestyle Roleplaying Forum. What from the books/movies exist in Hoggies, and what doesn't? - any original characters/families from the series. - any distant relatives to any of the original families, e.g. Ron's long-lost Aunt Hettie. - any original ghosts, professors, or specific creatures, e.g. the Bloody Baron, McGonagall, or Crookshanks). - any locations that relate specifically to original characters, e.g. The Burrow. - Voldemort, Death Eaters, The Order of the Phoenix, or any associated events from the era of the book series. There is no 'dark lord' on our canon. - history of Hogwarts, e.g. the four founders of Hogwarts (as historical figures), but not people like Dumbledore, or Nearly-Headless Nick. - Quidditch(! ), a duelling system, and many other parts of wizarding culture. If you want to read about what exists in our canon, check the HS.Net wiki. Can I have a character that's an animal / shape-shifter / vampire / veela / werewolf / demon? Why not? If your species/special power is not found in the Harry Potter universe, then no. We don’t have demons and other creatures from non-HP stories or movies. That would be chaos. If the special power you want exists in our universe, that’s great, but you will still need to apply for it. We can’t have a whole castle full of Veela, because that’s not part of the canon. If you are interested in applying for a special power, please check the Special Requests FAQ. If your special power is not approved, please don't take it personally. Special powers are very rare, but we get lots of requests for them. Your request is more likely to be approved if you've been here for over 1 IC term (3 OOC months) and have demonstrated your RPing ability. If your request is not approved, please be a good sport and adapt your biography and posts appropriately. While characters exist that are Animagi (turning into an animal at will) or werewolves, it is not canon for your character to be part animal by birth or any sort of talking animal. Also, wizards in the HP canon look like ordinary humans. Your character may not naturally possess a hair/eye color outside of what's possible in nature. Can I be the only kind of a certain type of student (has a special power, has this background, etc.)? You can include this in your application for a special power, but it’s ultimately up to the administrators to decide who gets which special powers. If you are approved for a special power, it’s possible that you might be the only student with that power, because some powers are quite rare. It's also possible that someone else will apply and be granted that power. There is no way to make sure that your background is exclusive to your character. We don’t allow plagiarism here, so no one can copy part of your biography, but it’s possible that another player might create a student with a similar story to yours. As long as it falls within the site rules, they are free to do so. If you find that someone’s character has a similar background to yours, why not think up a way to work that into a plot with them? Can I be a school ghost/painting/poltergeist? How do I do that? Yes! If you earn enough Gringotts points, you may cash them in for a ghost/painting. Visit the Gringotts Exchange to see what's on offer. There are a limited number of openings for these characters, so check the rewards list for available spots. You may have one student character at Hogwarts, and as many Elsewhere characters as you can handle. If you earn enough Gringotts points, you can cash those in for a second student character slot! Students are permitted an owl/cat/rat/toad at Hogwarts. Any other pets are considered special requests, and you will need administrator approval for them. Bear in mind that a smaller, domesticated animal (e.g. a dog) is far more likely to be approved than a big, wild animal (e.g. a wolf). Talking animals are not permitted. Don't talk about it! It's summertime, so try to concentrate on what your character is doing during the summer instead. You can still talk about what classes your character has taken/will take in general terms, but avoid mentioning specific houses or year groups. Most of all, just be patient! You'll be Sorted before you know it. I posted a thread and no one's responding. How do I get people to post? Is it an Open thread? Did you post it in the Open Threads list in the General OOC? When other players are looking for threads to respond to, checking the Open Threads list is the first place to go. Telling people in chat that you have a thread with no replies can sometimes help too. However, don't spam MC by repeatedly telling everybody about your thread -- just once is enough! How long should I wait for someone to respond? It really depends on who you're threading with! Some players can't dedicate the same amount of time to the site as others, and that's okay. Keep an eye on the Absences forum to see if your thread partner is going to be out or slow at posting. If it has been 6-7 days without a reply, and your partner doesn't seem to be formally absent, it may be okay to send a friendly PM saying that you're really excited for their reply. What things do I need to ask admin/GMod permission for? Anything that is going to affect a significant amount of other characters, or greatly alters your own character -- pranks, special powers, attacks, etc. should all be permitted by a staff member. For example, if you want to prank a cabin, that means your actions are going to directly affect lots of other characters. Additionally, special powers and special items must be requested as well. If you want something to happen (such as a wild animal attack), please check with an admin first. Camp Loki and Hogwarts are both very safe, and it is not likely that there are monsters or aggressive animals about. What are magic levels, and why do I need to know them for my character? Why can't my character cast wandlessly/non-verbally? I want my character to Apparate/steal souls/turn invisible. Why can't I? Magical levels are ways to measure how powerful your character is in certain areas. There are levels for Charms, Divination, Transfiguration, and Conjuring / Summoning. As your character ages, they should get stronger, and it is to be expected that younger characters should not be as powerful as older characters. You can earn levels by taking classes and extracurriculars at the castle. Special powers such as wandless/silent casting, and other fun abilities are reserved for skilled players who request them. You must submit a special request to obtain these skills. Apparition, however, is taught to all Hogwarts students who will be turning 17 (the legal age in the wizarding world), and a license can be obtained once a character is 17.
written by Esme Vartan; edited & updated by Calypso Ross [February 2016].